A few days ago I picked up what looked (and proved to be!) a tasty sauce, A Taste of Thai brand peanut satay sauce. Satays are spicy dishes with grilled vegetables (and other items); in Indonesia, where tempeh is a staple, satays are called sates. The sauce is quite perishable and needs to be finished in three days, so I'll make another sate/satay dish probably on Sunday or Monday. Tonight, I simply sauteed, in canola oil, Russian Banana fingerling potatoes cut into large chunks for a few minutes, then added a whole onion that had been sliced into medium half moons, maybe 1/4" thick, as well as a chopped clove of elephant garlic. I let that saute for a few minutes, then added a little tempeh (maybe 1/4" x 1/4" x 1/2") and halved Brussels sprouts, and let that cook a few more minutes. Finally, I added broccoli and diced (maybe 3/8") red bell pepper and sauteed just a minute or two till the broccoli was bright green. I removed from the heat and mixed in the peanut sauce, salt, and some chili powder. 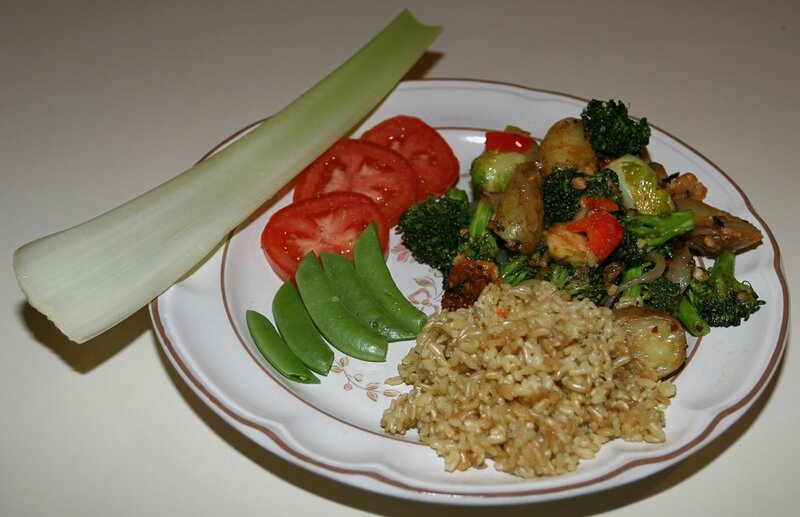 I also had made, with a vegan bouillon cube in my rice cooker, a nice variety of brown rice called "golden brown". Dinner was tasty! The pasta sauce that I described last night cooked from about 8a till 7p, or 11 hours. It smelled quite good, though it wasn't as fragrant as other sauces I've made in the slow cooker. It came out tasting very good, but I wish it were more chunky and not so runny; I chalk that up to using the electric chopper. 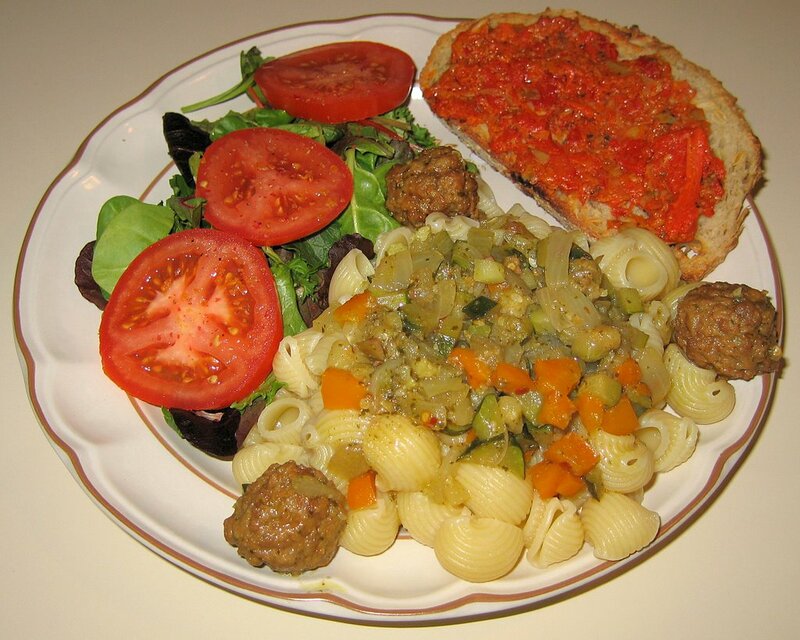 Our friend doesn't like olives, but the sauce could have used a half dozen or more chopped olives. 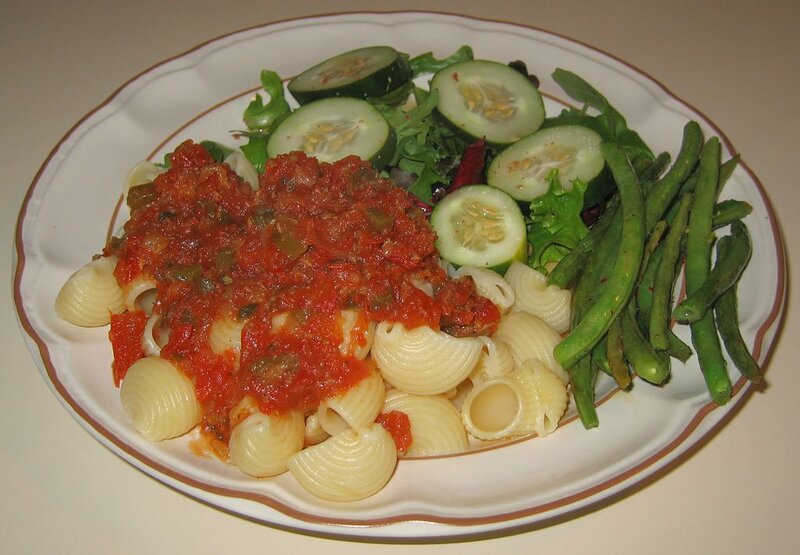 I served it over organic conchiglie seashell-shaped pasta, and then sprinkled on some Eat in the Raw's Parma! vegan "Parmesan cheese". But no complaints - all three of us enjoyed the meal. I also made some green beans in the simple but so-tasty style that we were introduced to in the Tuscan countryside this past October, just by briefly sauteeing them (after cutting maybe a quarter inch off of both ends) in olive oil then squeezing some fresh lemon atop them and sprinkling with salt and freshly ground peppercorn. By the way, I was delighted to be introduced to a blog by two vegetarians who found me in the midst of an interesting discussion about Cooking and Chromosomes where the articulate authors, Jai and Bee, were discussing stereotypical gender roles in the kitchen. Just for the record, I do almost all of the cooking for my wife and me (my wife doesn't enjoy cooking but eats out, at my parents', or makes a meal when I am out, such as when I'm teaching), and I also do the cleanup and most of the shopping. But I know I'm not "typical"! We're enjoying great weather today and for the past few days with temperatures even getting into the 80s (it looks like we broke a 60+ year record for high temperature today), so ate on our deck. I introduced my wife to Emperor's Forbidden Rice (actually deep purple and said to have been grown in China exclusively for the Emperor). It is easy to prepare this tasty short-grained rice by combining one part raw rice to one and three quarters parts water (or broth), bringing to a boil, then covering and simmering for about 30 minutes, removing from the heat, and letting it sit for a few more minutes. 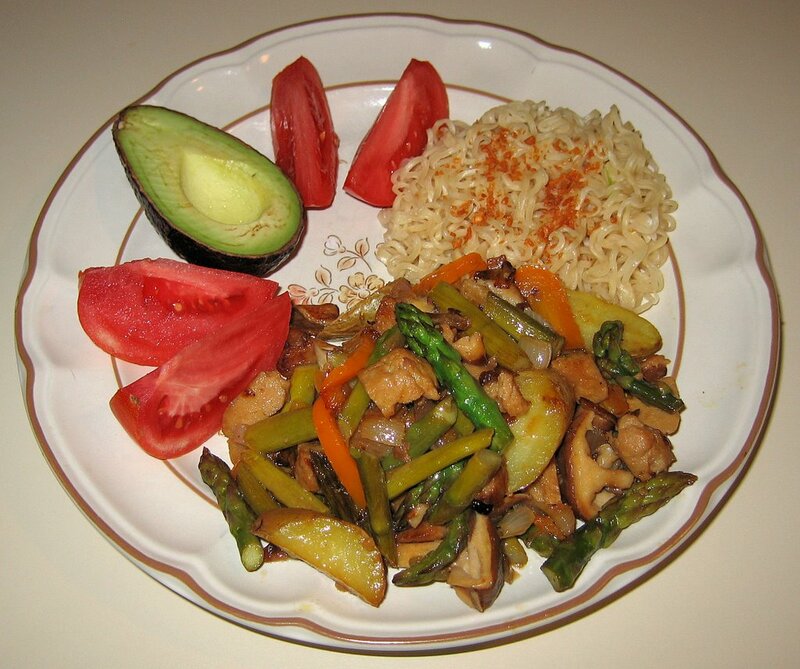 I prepared the rice in this manner, using a vegan bouillon cube in the water. When the rice was almost done, I mixed in some chestnuts, as well as diced Lombard peppers with the garlic they were marinating with (I bought this from a nearby store). It came out great! 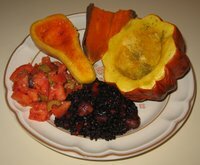 I also roasted baby butternut and acorn squashes, as well as sweet potato. I served a salad of chopped tomatoes mixed with olives. I'm overdue for using my slow cooker for some awesome sauces; we're having a good friend over for a belated birthday dinner tomorrow, so thought this would be a good opportunity to show off what the slow cooker can do. I'm thinking of using eggplant in a tomato-based sauce (not caponata, which I'd like to make sometime, as well), and serving it over seashell-shaped "conchiglie" organic pasta from the Montebello Monastery in Marche, Italy. I decided to make a big batch of sauce, filling most of my 1.5 quart slow cooker, so that I can use the leftover sauce maybe to make something like pizza later in the week. I was going to finely dice 10 medium roma tomatoes, after seeding them (see details from when I first made sauce with the slow cooker in January) but, on my wife's suggestion, used an electric mini-chopper. It had a tendency to puree the tomatoes, but I made sure that chunks remained. I added the tomatoes to the slow cooker, along with 3T olive oil, 1 1/2 t salt, 1/2 t coarsely ground peppercorns, 3t chopped basil, and 1t chopped oregano [t=teaspoon, T=tablespoon]. Because our friend loves rosemary (when he visits, he often caresses the large rosemary bush, imbibing its fragrance, that I planted near my front door), I also added a teaspoon of chopped rosemary. I finely diced six small cloves (not entire bulbs!) of garlic and 3 small shallots in the mini-chopper. I used a knife to dice a peeled medium neon (thin) eggplant into 3/8" pieces and cut half of a green bell pepper into 1/4" cubes. I sauteed the garlic, shallots, eggplant, and pepper for about 4 minutes till the eggplant was just cooked and turning clear, then transferred these to the slow cooker. As I did when I made sauce in January, I will plan on letting the sauce simmer for about 10 hours; I tried making a sauce a week later and found that having 10 or 11 hours to simmer is about right. Our friend is coming over at 6p, and my wife will turn the slow cooker on at around 8a. We had a very nice cooking class tonight and sat down to eat by 8:20p, so it took my students only about two hours to put together dinner. Tonight was Italian night. I had taken a block of tofu for each of the two teams of four students and frozen it overnight, then defrosted it at room temperature today; the freeze-thaw cycle opens up the texture of the tofu to make it more sponge-like in consistency, enhancing the taste and ability to pick up flavors. Because my wife, and sometimes I, suffer from digestion problems with tofu, I don't cook with it - with the only exception I can think of in my cooking classes. It was part of our main course eggplant saute. They also made a herbed orzo with lemon zest, a simple polenta side dish, starting with prepared polenta available in wrapped tubes. Their panzanella (bread salad) was great, as it always is! They also made a blueberry crisp for dessert. I was looking forward to using a plantain which I purchased last week and today it was mainly black - I like cooking with plantains when they get to this coloration. I sauteed tempeh for 6-8 minutes till it was brown, then added half moon diced sections of a small-medium leek (after cleaning it well) and sauteed for another 2-3 minutes. I then added some diced ginger and red jalapeno pepper, sauteed for an additional minute or so, added a touch of soy sauce, and turned the heat off. Then I mixed in some finely diced raw onion and let it sit in the hot pan for a minute or so. I sprinkled a little salt on top and served it with Lundberg Farms Black Japonica short-grained black and medium-grained mahogany rices that I had cooked with a vegan bouillon cube in my rice cooker. I also reheated the amazingly good (credit to the slow cooker!) thickened soup that I had made last week. On Friday evening, I was a judge at the annual statewide NC Student Academy of Science competition for Middle School and High School entries in math and computer science and a boxed dinner (a pita wrap with vegetables and baked potato chips) was included. My wife and I visited Charlotte this weekend; she is part of a classical Indian musical group that met on Saturday, and a homemade Indian dinner was included. Yesterday, we spent the evening with friends of ours and shared two delicious pizzas at Wolfman Pizza, which uses no animal products in their crusts or sauces. Today I was cycling and stopped by Whole Foods Market, looking for a few very small items that I could easily bring back on my bike. I found that they had baby golden beets, which I've not seen before! I made a simple but filling dinner. I cut the baby beet roots and put them in a steamer for about 20 minutes (but might try 25-30 minutes next time); 5 minutes before they were done, I put in the beet greens, which quickly cooked. I simply served with just a little salt. I cut up some tempeh into medium-small cubes and sauteed till brown, about 6-8 minutes. Then I added some chopped baby bok choy and sauteed another minute or so. I removed from the heat and added a little bit of soy sauce. I served it over brown basmati rice that I had cooked in water with an added vegan bouillon cube. I made a fairly simple dinner tonight. I got some onions, cut into half moons, simmering, covered, in olive oil for as long as convenient (I think I had them going about 20 minutes). Then I added some red jalapeno and broccoli, and covered the pan, again, letting it cook on low heat for 5-10 more minutes. I made a Brussels sprout saute, and mixed in some Frontera brand cilantro green olive salsa when it was done. 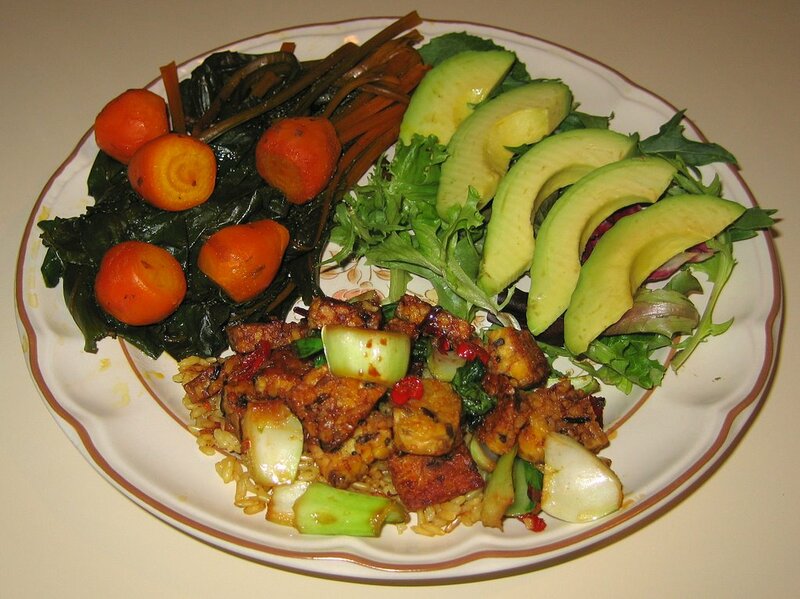 I thought that I would try a combination of occidental and oriental tastes by preparing a scramble with baby bok choy. I cut tempeh into rectangular cubes approximately 1/4" by 3/8" or so and made 1/4" half moon discs of a small thoroughly washed leek. I sauteed the tempeh and leek for about 5 minutes till the tempeh was starting to brown, then added in roughly chopped (pieces maybe 1/2" or so) baby bok choy and sauteed just another two minutes or so. 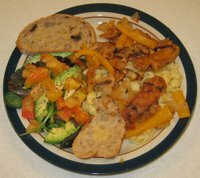 Rather than mixing in a hot sauce or perhaps ginger or garlic, I simply added about a quarter small can of tomato sauce, as well as salt and pepper, and served it over trofie pasta, along with avocado and hearty potato-onion bread. My wife really enjoyed the meal; I thought it was good but not very memorable. I can't think of what I would change in the dish, and I wouldn't mind eating something like this again. Tomorrow I have a new 6-week cooking class beginning, so will post a picture of one of my students' plates in tomorrow's blog entry. In late January, I had made a leek-potato-barley soup and, though we've had weather just a few days ago above 80°F, the last few days it has been cold and it is expected to drop below freezing tonight (our average last frost date here is April 17 - and the first date is October 25), so I wanted to make something warming. I thought of a soup I could try to make, using that experience as a base, but I didn't start till the afternoon, so used the high setting on my slow cooker since I had about 4h of cook time, not 8-10 hours. The idea of including carrots sounded good, and I also wanted to try to cook with the hemp milk that we have been enjoying. I also wanted to make a thicker soup and try mixing in some dehydrated potato flakes; usually a velouté is soup thickened with a white roux, but this is my version of a velouté! I put in the slow cooker 6 Russian Banana fingerling potatoes cut into large chunks; a large carrot cut into slices a little larger than 1/4"; a small leek cut into half lengthwise, carefully washed, and then cut into 1/4" half discs; half of a small red onion cut into 1/4" or slightly larger cubes; about a third of the roasted red pepper that was left when I made risotto last week, diced into 1/4" cubes; a third cup of hulled barley (when I made the leek-potato-barley soup, I had used a half cup); a cube of vegetable bouillon; fresh herbs from my garden (the oregano had a very short dormant period, from approximately February 1 till a day or two ago, when new leaves emerged!) - about a teaspoon of oregano and a tablespoon of chopped rosemary needles; a teaspoon or so grated ginger; a cup of water and 1 1/2 cups of Living Harvest brand Hempmilk™ (I had used 2 1/2 cups water in the January soup); and a little salt and freshly ground pink peppercorns. I also added about 1/2 teaspoon of diced red jalapeno pepper and maybe 1/4 teaspoon of dried dill weed. 4 1/2 hours later when I was ready to serve dinner, I mixed in about 5 tablespoons of dehydrated potato flakes and about 3 tablespoons of Eat in the Raw's Parma! vegan "Parmesan cheese". Boy, did the slow cooker do a great job! We loved the velouté. The potato flakes gave it a nice thick consistency, and there were nice hints of jalapeno heat and so many nice flavors, such as "cheese" and dill. 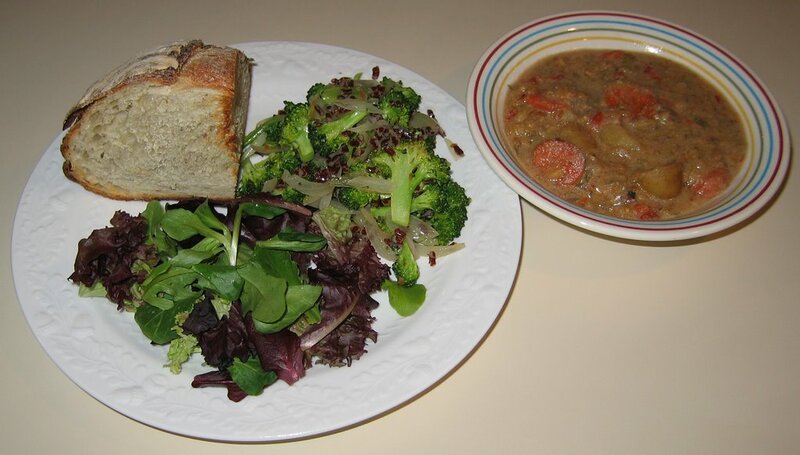 I'd like to try something like this again; it's difficult to think of improvements, but I might try including a little bit of red wine and some capers, and I might reduce or eliminate the barley (we love the barley and it is great with thinner soups, but somehow I think a creamy soup like this may be better with less or no barley). I'm so glad that the hemp milk worked out well. I have seen recipes where "milk" is added near the end; I suspect that is to keep it from curdling, which the hemp milk did - but it wasn't an issue as I could stir it all back in, and the potato flakes clouded the liquid so that any remaining particulates from the hemp milk blended in. I also did a brief saute of broccoli with strips of shallot. I wanted to keep the crunch in the vegetable and serve it fairly simply, without any sauces. I simply sauteed the shallot and broccoli for about 2 or 3 minutes over medium heat, then mixed in the leftover red rice from Friday just for a minute or so to get it to heat up, and then added some salt and freshly squeezed lemon juice. We also enjoyed it! We also had the good luck to have some fabulous onion - potato - rosemary bread, gently toasted, from Weaver Street Market. It was nice and soft inside and so tasty! Yesterday, we attended a celebration of the poet Rumi's 800th birthday! You can see pictures and video that I took of the event. We were out earlier in the day as well (I taught in the early afternoon, I joined my wife for grocery shopping, and then I worked out), so ate out at Panzanella (a restaurant behind and affiliated with Weaver Street Market). We were disappoionted when we ate there a year or more ago, but last night was very good! They had some vegan pesto in stock, so we had a salad, a delicious pesto pizza with artichokes, a good Pizza Margarita, and spaghetti, all shared amongst two friends, my wife, and me. 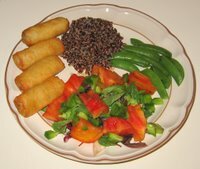 Those Ling Ling brand mini spring rolls that I made in late February were quite tasty and just the thing for a quick meal I had to put together tonight. 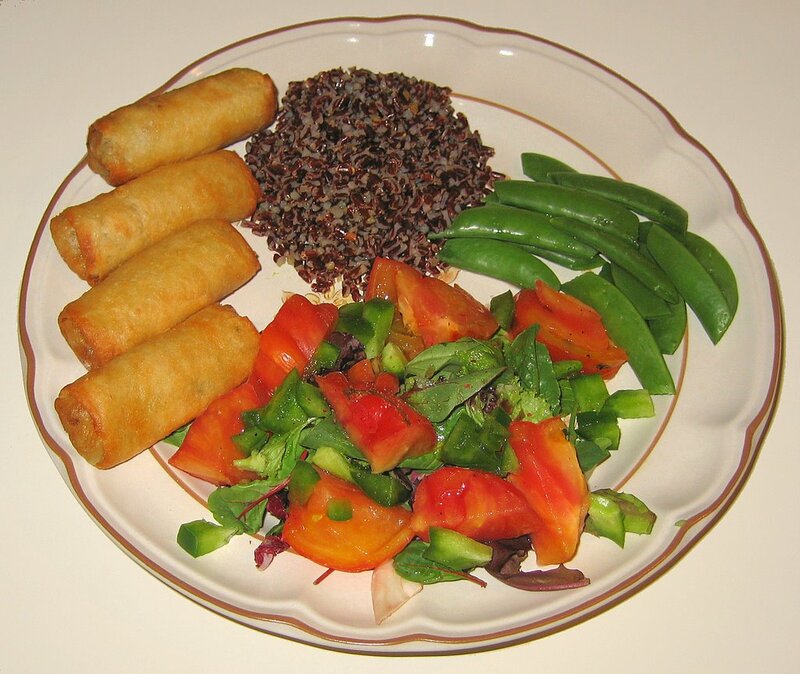 It was a simple dinner of those spring rolls with red rice. I also made a salad and topped it with Ume plum vinegar, olive oil, salt, and pepper. This is my first anniversary for this blog! We've been having fabulous weather in the 80s (but tomorrow it's going to get down to the 40s! ), so last night and tonight we had fun eating on our deck. I heated leftovers from the last few days. 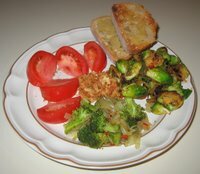 I also made a tasty dish with Broccoli and Brussels sprouts. In a medium-high pan with no oil, I put pine nuts and, almost continually tossing (the nuts burn easily), I gently warmed the nuts till they were light brown, then I removed them from the heat and set them aside. I cut 3 cloves of garlic into slivers and sauteed them for a minute or so, then added diced ginger and jalapeno pepper, as well as broccoli and halved Brussels sprouts. I stirred and sauteed for maybe five minutes, then turned the heat off, mixed in the nuts, and added some paprika and salt. I was thinking of using a sauce, but opted for this simpler dish as it actually tasted quite complete. This classic Northeastern Spanish dish from the Rioja area can be enjoyed tapas style with many other savory dishes or just enjoy it on its own. 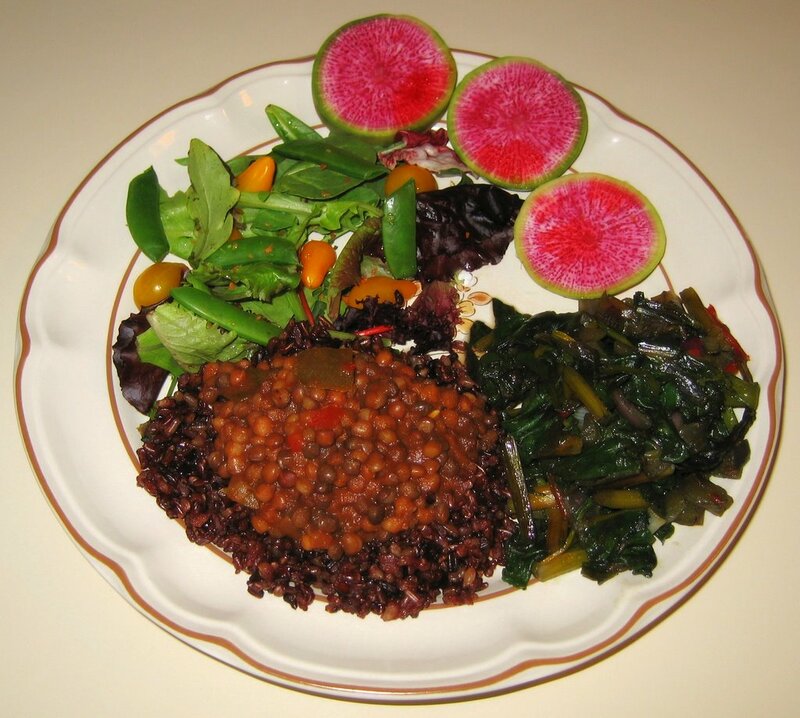 The lentils are slow cooked in a broth called Sofrito, made with tomatoes, oil, onion, and red and green peppers. Ole! Tonight, I used it as a key element of my dinner, adding some freshly grated ginger when I heated it. I started some Lundberg Farms Black Japonica short-grained black and medium-grained mahogany rices and their Jubilee brown and black rices cooking in my rice cooker, along with a vegan bouillon cube, and gave the rice about 50 minutes. When the rice was done, I served it, made a big bowl indentation in it, and put the lentils into that crater. Yesterday at Whole Foods, I purchased golden beets. I hope to cook with them in the coming days, but today I took their greens and made a simple dish. I started some medium diced red onion sauteeing along with the stalks of the beets, cut into maybe 3/4" lengths. When the onion started turning clear, I added the leaves that I had roughly cut into approximately thirds. I sauted just a few minutes till the leaves cooked down, adding whole cumin in the last half minute and then, before serving, mixing in freshly ground black pepper and salt. Along with the salad, we had some watermelon radish slices (it's attractive - you can see some pictures of mine, such as this one or others in the same gallery). 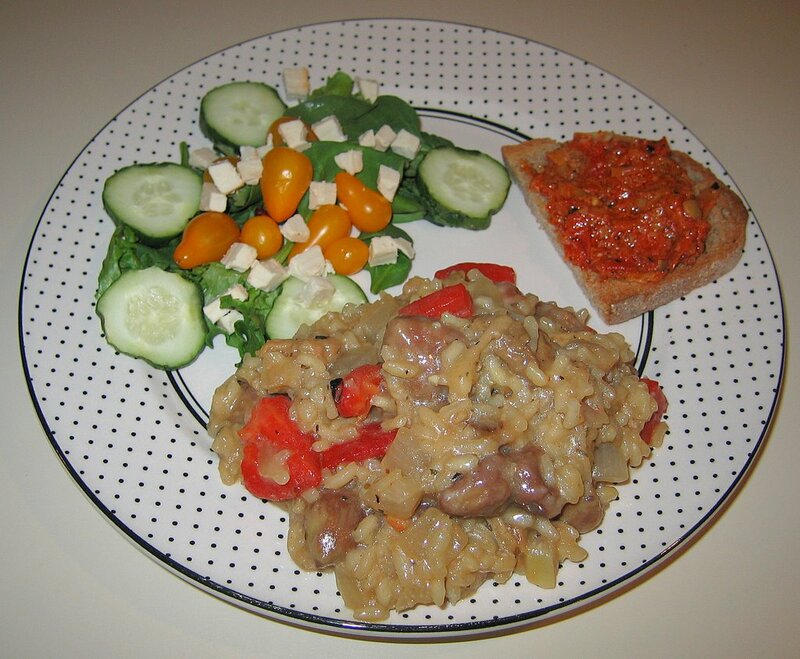 We enjoyed dinner - I'll have to come up with a Spanish Lentil dish with my slow cooker. My wife and I were both out much of the day and when I came home around 9p, she had already stopped by my parents' and decided to eat with them. 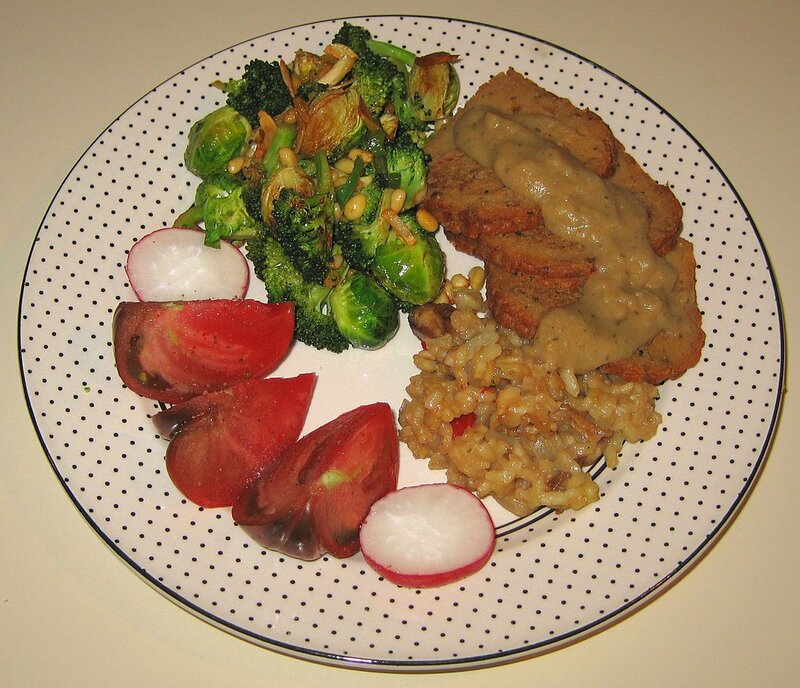 So I simply heated some leftovers for myself - Sunday's risotto and Friday's beet and seitan dishes. 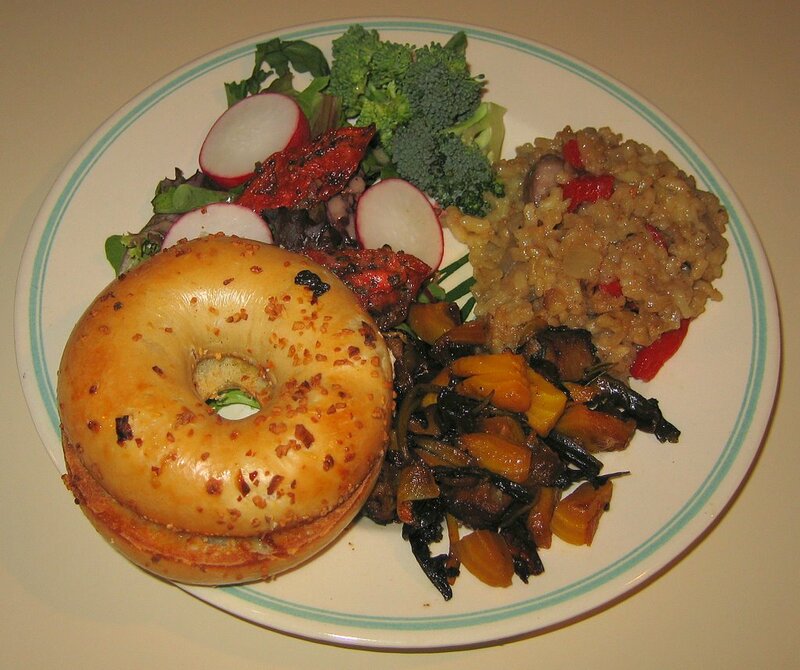 I also had a garlic bagle and salad. 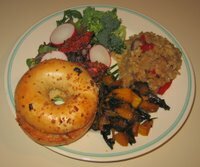 I am overdue for grocery shopping but luckily had a nice Field Roast handmade stuffed vegan (with apples, squash, and mushrooms) Celebration Roast in my refrigerator. 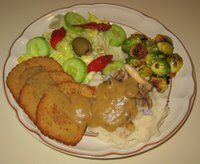 When I cooked with this roast in January, I used a lime-pepper gravy. 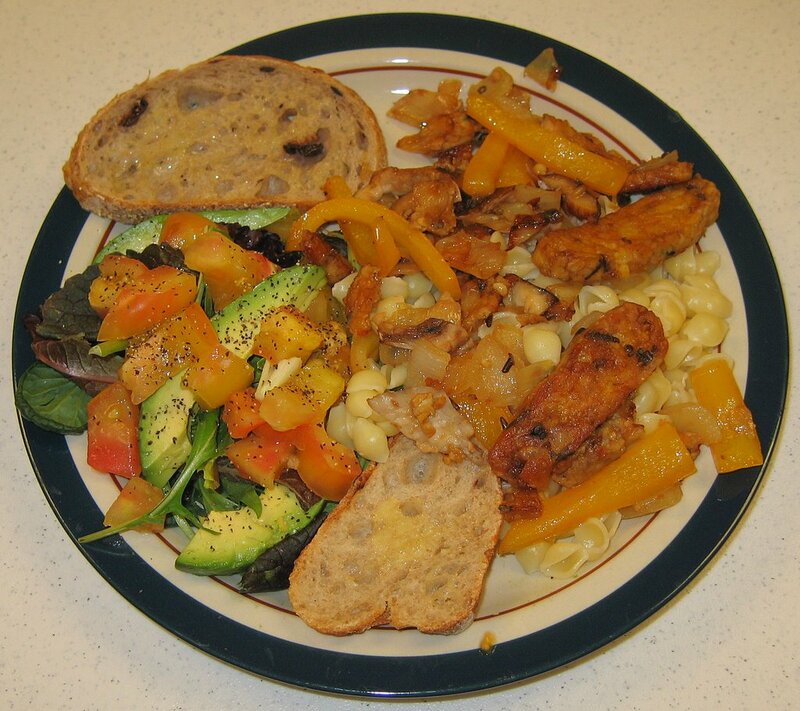 Recently, I had picked up a package of vegan gravy mix from Road's End Organics, an all-vegan company that makes a line of vegan macaroni and "chreese", also makes gravies, including a savory herb mix, that I used. It's easy to make these roasts - they just require heating in a moderately hot oven for a few minutes. I prepared some mashed potatoes with a little sauteed elephant garlic and served it with sauteed mixed mushrooms on top. I also grilled some Brussels sprouts and elephant garlic, mixing in a little Baja Lime marinade, salt, and pepper. I put the gravy on top of the roast slices and potatoes. It was a tasty and very filling dinner! Ever since I first made risotto back in May, my wife and I always look forward to this delidious and creamy dish. I coined the term "Conference Call Risotto" when I crafted the way I make risotto back in May, and since then only have made it once more in late December, when I made Butternut Squash Risotto. Today, I took advantage of some nicely packaged roasted chestnuts I found at Trader Joe's. I recently purchased some dried porcini mushrooms - I can't remember ever reconstituting dried mushrooms (in fact, I have some dried Brazilian mushrooms sitting in my refrigerator that I should now use), but tried it today and it worked great! I simply soaked the mushrooms in hot tap water and white wine for about 20 minutes till they were softened. Then I poured the liquid through two layers of paper towel to trap any particles and save the mushroom liquid, and gently squeezed the mushroom pieces. As described in making my Conference Call Risotto, I used a 6 ounce container of soy yogurt as my unit of measurement. I prepared about 3 1/2 units of vegetable broth and mushroom liquid. I chopped into a medium dice about a third of a medium onion, a fifth of an elephant garlic bulb, and a small shallot and, in a heavy nonstick pot, sauteed the onion, garlic, and shallot for a few minutes till they were becoming clear, then added the mushroom for another minute or so. Next, I added a unit of arborio rice and stirred till the rice was mostly clear and not white, maybe two minutes. I added a unit of white wine and stirred till the wine was absorbed, another minute or so. Then I spent the next half hour or so adding a ladle or so full of the hot broth, stirring the mixture. I made sure to never have the rice swimming in liquid, but always moist. Near the end, I added about twenty of the roasted chestnuts (just to heat them), some salt, freshly ground black pepper, vegan Parm! "parmesan cheese", maybe a teaspoon of dried oregano, and maybe 2/3 of a large chopped roasted red bell pepper (I had roasted the pepper before the risotto got underway - I simply let the pepper sit on the gas burner, occasionally turning it, till it was mostly blackened, then put it into a bag to absorb the smoke flavor; when I needed to cut it, I first teased off under running water the loose black coating). It was so creamy that it didn't need any margarine - we loved it! I also served (purchased) roasted red pepper and artichoke bruschetta served atop seedless rye. We continue to love the cute yellow pear tomatoes! On my (but not my cheese-of-any-kind-averse wife's) salad, I included cubed blue "sheese" from Bute Island Foods. 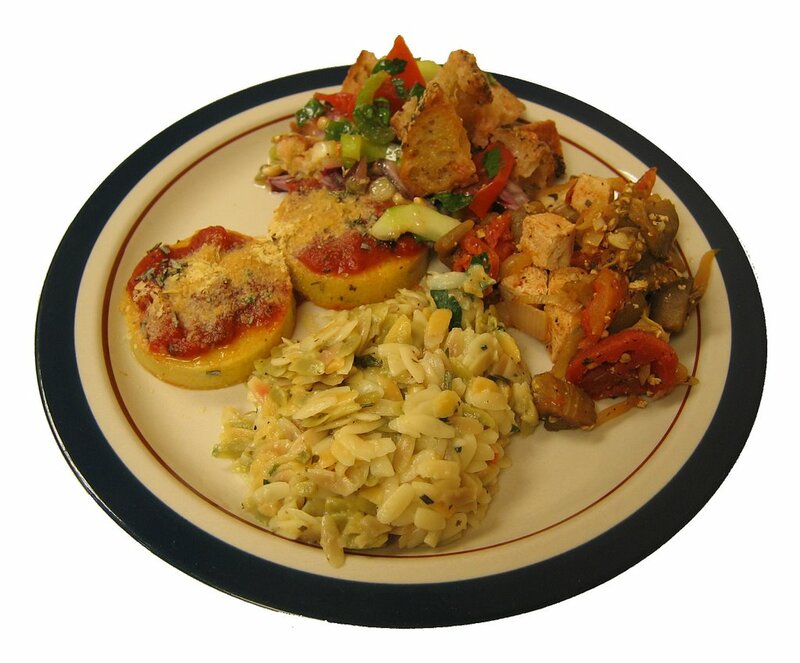 Yesterday we had a vegetarian society potluck dinner. Like today (we are enjoying very nice weather! ), my wife and I enjoyed bicycling much of the day, and I had less than an hour to put the potluck meal. 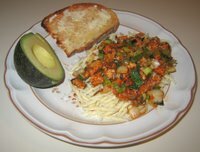 I sauteed tempeh, onion, and asparagus, and mixed in broken pieces of rice fettucine, along with lime, salt, and pepper. It was good and I'd like to make something like it for one of my dinners at home. We loved the golden beets that I've made twice, especially the dish with Brussels sprouts from a few weeks ago. 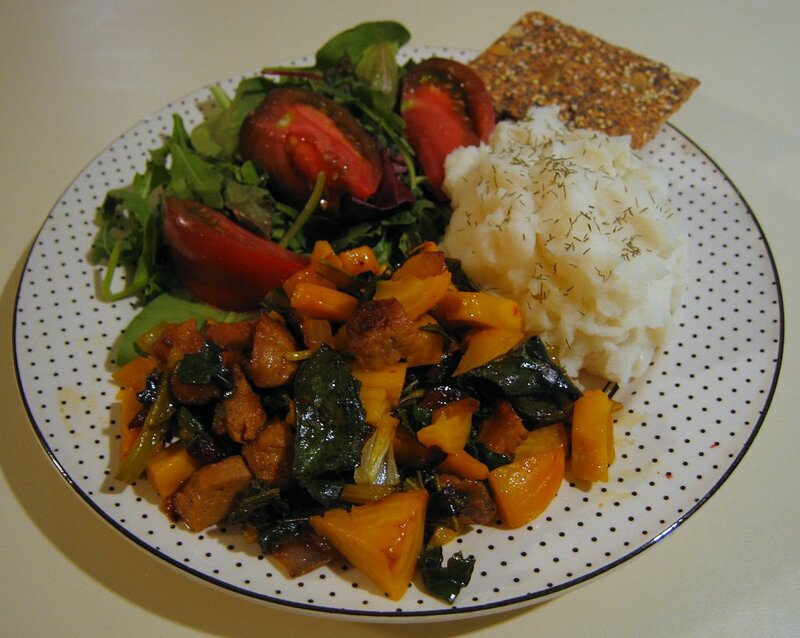 I purchased golden beets yesterday and decided to try a variation on that dish. Like I did last week, I trimmed off the tops and bottoms of the beet roots then steamed the roots for about 40 minutes. After a few minutes when they cooled a bit, I put each in turn under cool water (to make it easier to handle) in a bowl and rubbed the skin off, then cut it into chunks that were about 1" long and 1/2" in width and depth. In the meantime, I sauteed large chunks of seitan and onion for about 10 minutes till the seitan was nicely brown, maybe 10 minutes over medium-high heat. I roughly chopped the beet greens into thirds and added them to the saute for about two minutes, then added the chopped beet roots, as well as about a tablespoon of chopped rosemary needles, a little Baja Lime marinade (I've been using this a lot recently - it's yummy! ), salt, and freshly ground pepper, and stirred for just a minute before serving. I served the beet dish with mashed potatoes. It came out well - we really enjoyed it! But I think the Brussels sprouts from a few weeks ago was even better. I love how they don't seem to so readily stain, like red beets do. By the way, as I mentioned recently, we found Living Harvest brand Hempmilk™ made from hemp seeds and we both continue to love it! All the flavors - regular, vanilla, and (what I drank with dinner tonight) chocolate are amazing - creamy and tasty, and very nutritious. If this hits the market so that people can easily find it, I think that soy- and rice- "milk"s will be in danger of losing a lot of sales volume! We had a late dinner tonight; my wife was in Winston-Salem for work and didn't get home till after 9 and I got home even later from a nature photography meeting. I had the idea of making a rice noodle dish with grilled asparagus and one of the ginger sauces that I've seen by The Ginger People. I asked my wife to pick up some thick fettucine sized rice noodles and the ginger sauce. She, alas, bought a rice fettucine. It seems like a fine product (Deboles brand rice fettucine) and I think I've used it before, but I think it would be more suited to being prepared like pasta. It ended up being a bit glutinous. Also, the sauce that she purchased was a sweet ginger chili dipping and cooking sauce - it is sweet and (a bit too) spicy hot; I was looking for a more pure ginger sauce. Anyway, I started in my cast iron pan grilling asparagus. I cut the spears in uneven halves, with the tops being a little bigger. That only took a few minutes on medium heat (I don't think I ever cook in that pan any hotter than medium heat). I removed the asparagus and started searing portabello mushroom caps as well as thin slices of seitan; that took about 5 minutes or so. In the meantime, the rice fettucine was boiling for 8-12 minutes (I found it to be just done in about 10 minutes). When it was done, I drained it and washed it with cold water. I mixed the asparagus and a little of the sauce in, as well as some salt and sesame seeds, and served it. I served the mushroom, ridge side up (bottoms up), with the seitan and a teaspoon or so of Baja Lime marinade on top, along with a rosemary garnish. Salad included Mexican pear/teardrop tomatoes and heirloom tomatoes as well. Dinner was pretty good. Neither of us disliked the fettucini, but did find it a bit too fiery and not very tasty. 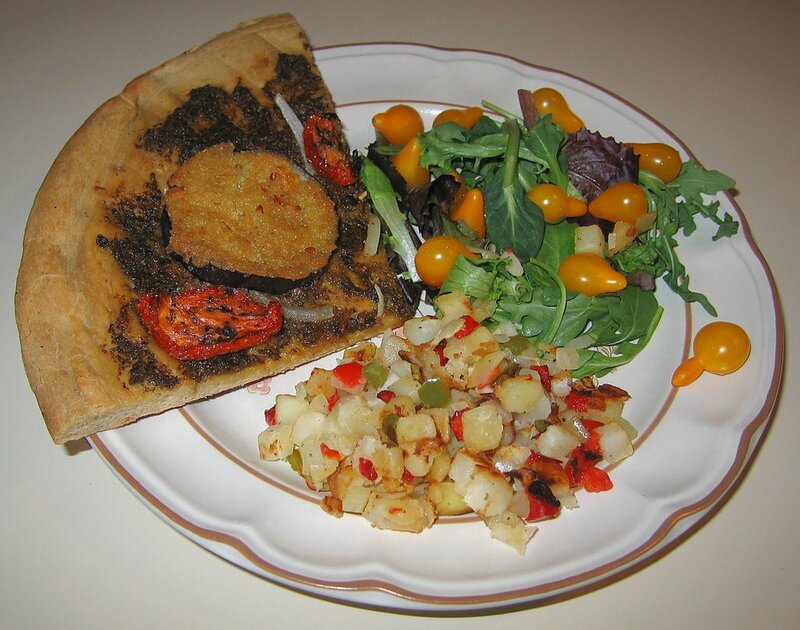 with a sour dough ready-made Rustic Crust brand crust. Back in the fall, I had made a delicious batch of pesto and it surprisingly kept! I kept postponing using it as I wanted to savor it, but today I used it up. I had my wife preheat the oven so that the pizza stone could get nice and hot. I grilled some prepared frozen breaded eggplant and topped the crust first with the pesto and a little additional olive oil, then the eggplant and roasted tomato slices. I baked for about 10 minutes on the stone to get a crispy crust. I also served a salad with cute and tasty organic Mexican "pear" or "teardrop" tomatoes, as well as sauteed frozen prepared Potatoes O'Brien (cubed potatoes, bell pepper, and onion). We both loved the pizza! Yesterday, we had a nice conference banquet. The hotel prepared a good dish of I think breaded chickpeas for me with some vegetables. It was tasty but a rather small serving. I was at a conference all day and had just a few hours to cook and prepare for a Gandhian non-violence class that I teach. I made a reasonably interesting dish that didn't take so long. I put some olive oil (I always use extra virgin) to cover the bottom of a small saucepan and, over low to medium heat, warmed the oil. I cut about 1/3 of a large onion into medium small pieces, between 1/4 and 1/2", and put them into the warmed oil. I covered the pan and cooked the onion for about 15 minutes. 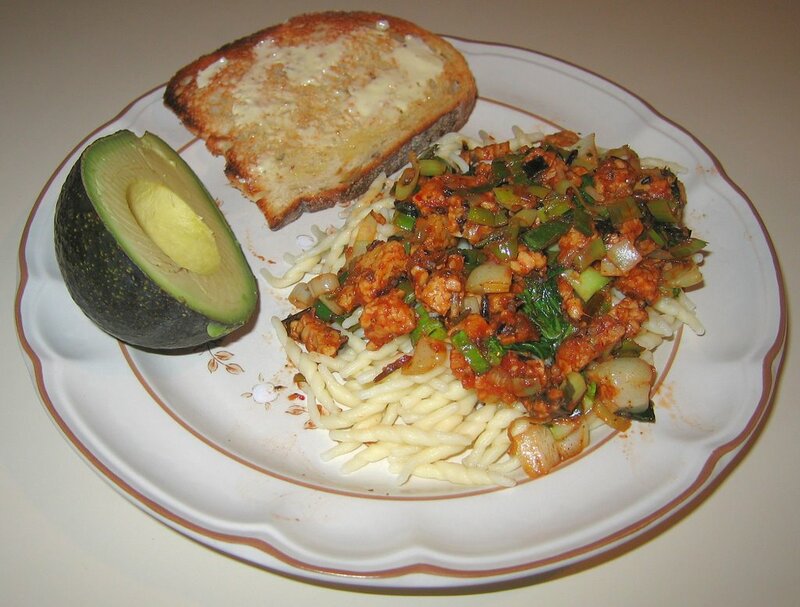 Ideally, I would have liked to let the onion cook slowly for longer, but we were hungry, so I then increased the heat to medium-high and added, 1/4" cubed, a zucchini and about 1/4 of a orange bell pepper. I stirred for about 3 minutes, then reduced the heat to low-medium and added some Nate's vegan savory mushroom "meatballs" and 3 teaspoons of frozen basil. I let that all simmer for about 15-20 minutes. In the meantime, I got water boiling in a large pot then reduced the heat while I added seashell-shaped "conchiglie" organic pasta made at the Montebello Monastery in Marche, Italy. I then turned the heat back up and cooked till al dente, about 9-10 minutes. Then, I sprinkled a little salt, crushed red pepper, and some vegan Parma! "Parmesan cheese" into the sauce. I served the sauce over the pasta, along with a salad and a 12-seed and grain toast with roasted red pepper and artichoke bruschetta (which I had purchased). I have been attending a very interesting photography conference since Saturday. The schedule is quite full, sometimes starting as early as 7:30a (!!!) and ending past 9p. On Saturday, my Mom invited us over for dinner and yesterday I ate at the dinner hosted by the conference (I had some grilled vegetables and salad). Tomorrow is the banquet (the event actually runs through Wednesday), and a gourmet hummus and chickpea dish is promised. Tonight, I put a dinner together with seitan, fingerling potatoes, asparagus, shiitake mushrooms, and orange bell pepper. I sauteed the potatoes cut into large pieces (roughly, halved), half of a large onion diced into maybe 1/4" cubes, and seitan cut coarsely into large chunks (maybe 1/2" - 3/4" in size) for about 15 minutes. Then I added the rest of the vegetables and half of a jalapeno pepper, finely diced, for another 15 minutes. I seasoned with a little (maybe four tablespoons?) Baja Lime marinade, salt, and black pepper. I served with ramen noodles and garlic gold nuggets. Yesterday after class, our friends visiting from California joined us for a last meal on this trip (we have enjoyed spending time with them and are sad that they are leaving - it's unlikely they'll return on business, though we hope that they'll come just for fun) as they're leaving early tomorrow morning. One of my photography students and her husband made us a delightful party of six, and we ate at Sage Vegetarian Restaurant, where I ordered what I usually get, their Faisanjan Persian pomegranate stew (a reduction with tempeh) over brown rice. I'm attending sessions at the annual conference of Professional Photographers of North Carolina tomorrow through Wednesday. Tomorrow in particular is a great all-day session with Hanson Fong and John Woodward on lighting and posing - then planning on attending an 8p South African dance performance at Duke University, so we'll probably eat out at least tomorrow. We had guests for dinner tonight, a couple visiting the area for several weeks on work from California. We are also meeting them for dinner after my class tomorrow night. I had some golden beets (greens and roots) and red beet roots. The greens are apparently even more nutritious than the roots. I put the roots, just basically trimmed but not peeled, in my steamer and steamed the beet roots for about 40 minutes. They looked neat in the last 10 minutes (or longer - I just noticed at this point) when they were gently bubbling. Then I put each beet under cool water long enough that I could handle it and gently rubbed the outer skin. I cut off a little of the very top and was ready to serve it. For the greens, I coarsely chopped into thirds or fourths. In a saute pan, I started sauteing some elephant garlic, cut into large chunks (maybe 1/2" cubes), and slightly smaller chunks of smoked apple sage vegan sausage. I cooked for about 10 minutes; the garlic was light brown and the sausage getting crispy. I added the beet leaves and sauteed another few minutes. Then I added some Baja Lime marinade, salt, and hot chili powder, mixed, and removed from the heat. 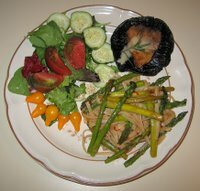 I also served some grilled asparagus and a salad that included roasted tomato and orange bell pepper. 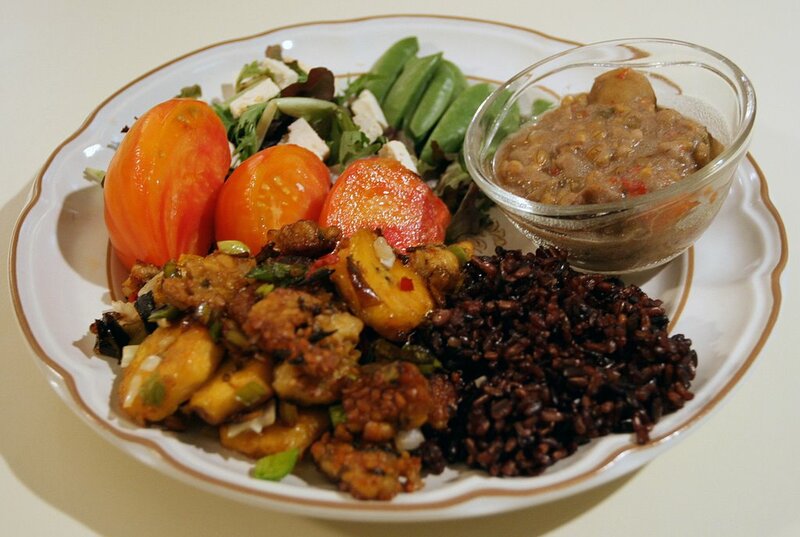 In addition, I had made Lundberg Farms Black Japonica short-grained black and medium-grained mahogany rices cooked with a vegan bouillon cube (ratio of 1 rice to 2 liquid cooked in my rice cooker for about 45 minutes) in my 10-cup Zojirushi rice cooker. I think that everybody enjoyed the meal. 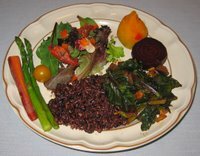 I wish that I had made more of the main course with beet greens. I wonder if I could enliven the beet green course with some more color.